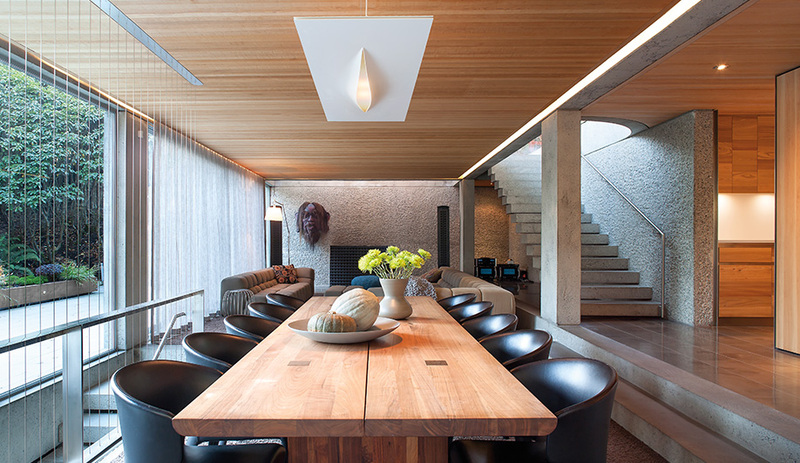 The dining and living areas are on the lower level of the house. Celerina table by Matteo Thun for Riva 120. 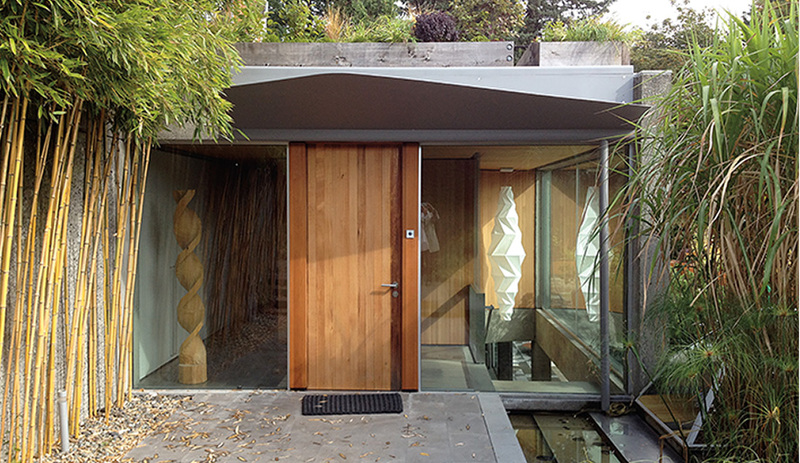 BattersbyHowat Architects takes on the ultimate challenge: renovating Arthur Erickson’s all-concrete icon into a livable – and waterproof – family home. The modernist house was once the signifier of a brave new age. 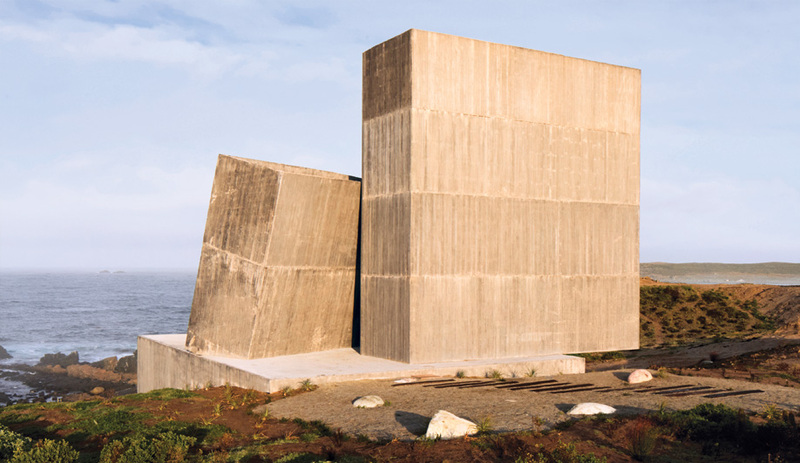 But what happens when a future-forward structure becomes a restoration pro­ject? The question looms over us, as mid-century landmarks begin to crumble. 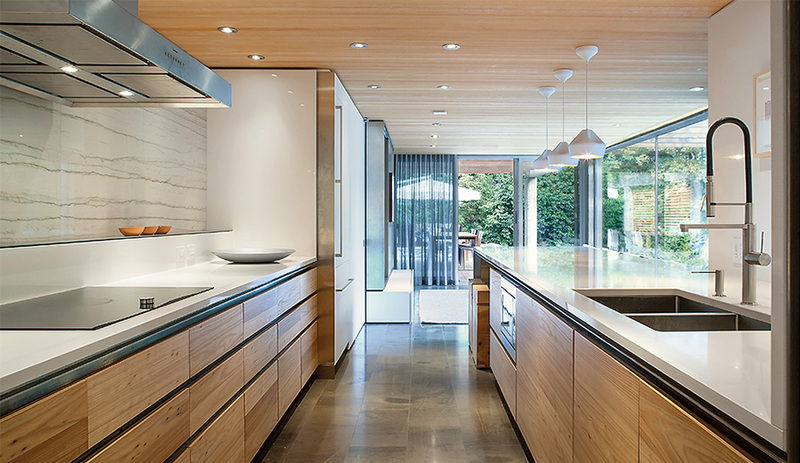 One of the main structural changes the architects made was to expand and open up the kitchen. Napa Big stools by Terry Dwan for Riva 1920. The hallowed principle of demarcating old from new with contrasting add‑ons and additions doesn’t always make sense with modern-on-modern, and changing living patterns often require a whole other kind of design overhaul – or do they? An impermeable membrane was added to the exposed (and leaky) concrete beams that extend to the outdoors. 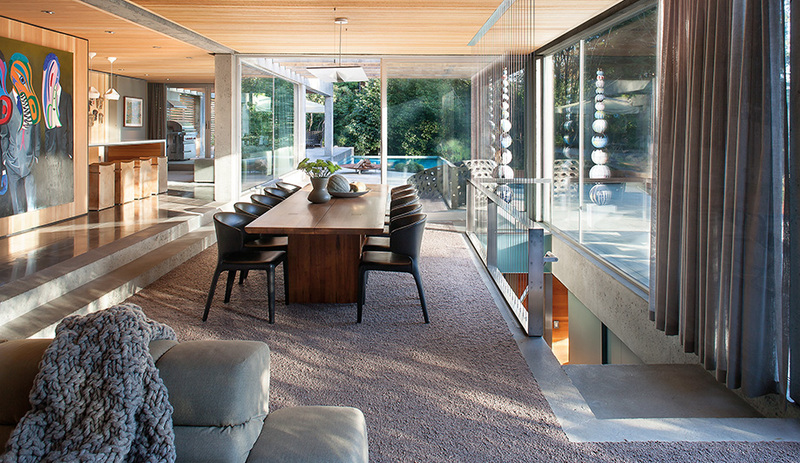 On the slopes of West Vancouver, few residences are more iconic than Arthur Erickson’s Helmut Eppich House. 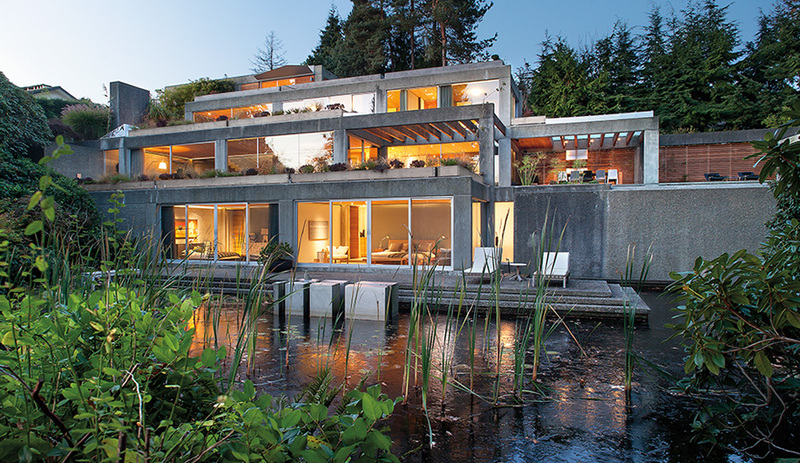 Built in 1972 for the self-made businessman (co-founder of EBCO industries) and his wife Hildegard, it was Erickson’s first house rendered in concrete yet built as a post-and-beam, in true West Coast style. Cantilevered stairs cut a diagonal trail through the glazed facade, evoking “sculptural objects, symbolic bridges and a dense site of phenomenological ekstatis, literally, astonishment,” enthused scholars Ricardo Castro and David Theodore in their 2006 monograph, Arthur Erickson: Critical Works. A painting in the family room hangs on a moving wall that hides a flat screen TV. Enlisted to update the property, Battersby and partner Heather Howat grappled with how to approach such legendary architecture. Rather than reinventing it, the modus operandi involved reformatting it with some restraint, and applying the firm’s signature vocabulary throughout, not unlike a contemporary crooner reinterpreting a Billie Holiday classic. 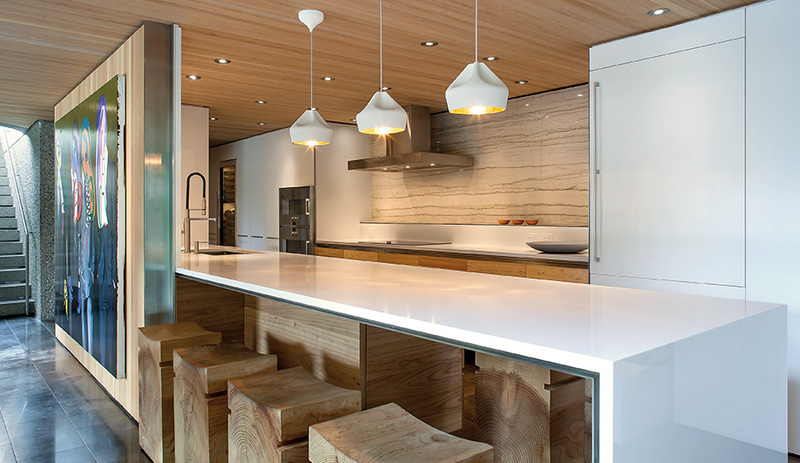 Elm veneer cabinetry and Corian work by Lauten Woodworking. Quartz counters by Bordignon Marble & Granite. Eppich House stands as a stark reminder of modernism’s over­confidence in its own tenets. Of the Vitruvian ideals of durability, utility and beauty, it embodied the third quality – often at the expense of the others. The relentless West Coast rain would often seep along the exposed beams that run from the outside to the inside, and the open stairways and landings were delightfully free of such visual nuisances as railings. The dearth of balustrades around magnificently artful stairways has long posed a potential hazard for the very young, the very old and the very tipsy. “We were told that the Eppichs would never have put in handrails, because Arthur would have had a fit,” says Battersby. To address the issue, the firm inserted steel cables, strung floor to ceiling, which made the structures gracefully safe. The careful use of metal detailing – at which Battersby­Howat excels – now prevails throughout, with refined steel door frames and aluminum grilles replacing their aging wooden counterparts. 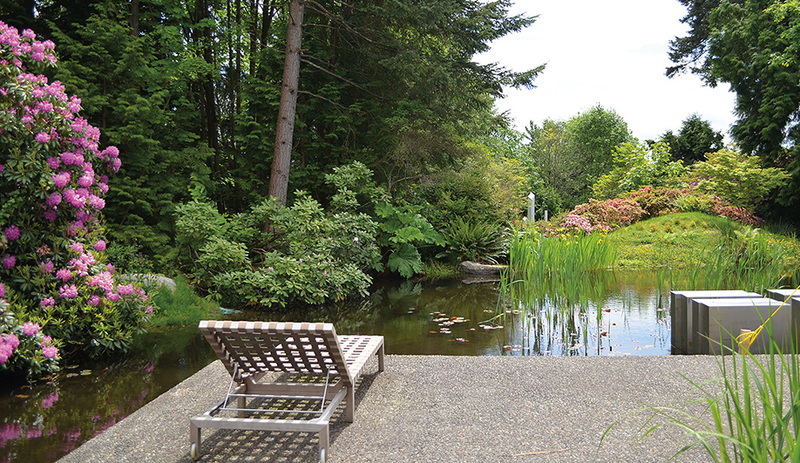 When Erickson, an avid gardener, designed the house in 1972, he diverted a stream to create a reflective pond that still thrives. entering by way of the facade, the architects affixed three chevron-­shaped metal canopies over the most exposed sections, including the front entrance. 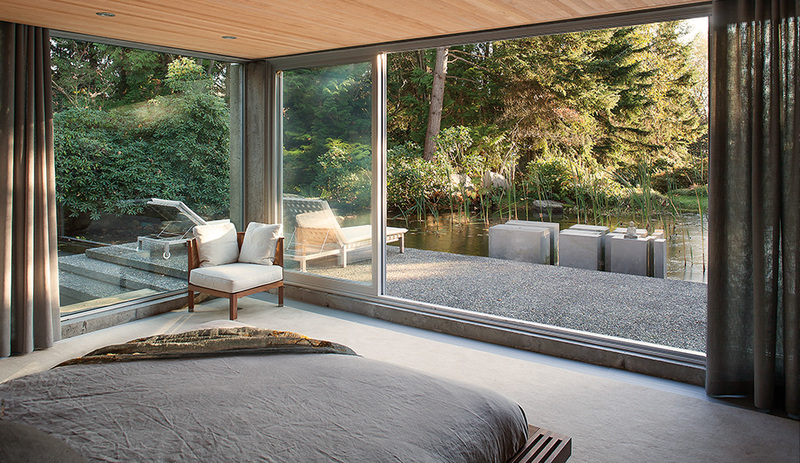 One glazed corner of the master bedroom faces the backyard’s lush vegetation. Another challenge: making a starkly minimal, open house more family friendly. 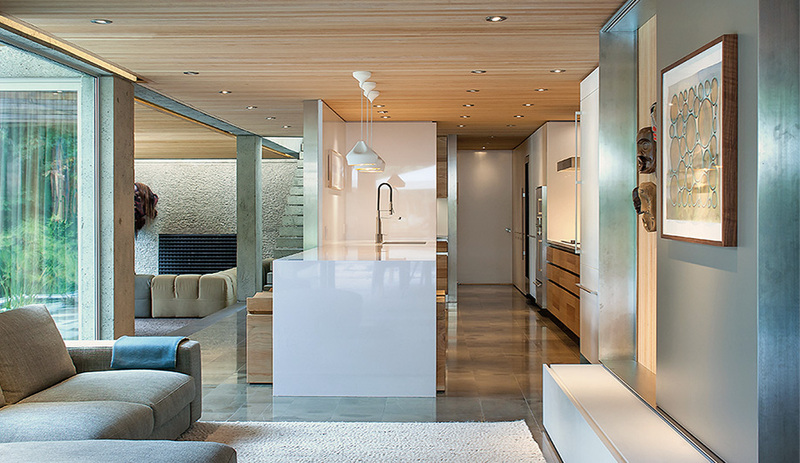 To this end, the galley kitchen was enlarged and reconfigured as a partial open plan, the better to splay out within. On the lower level, the den has been repurposed into a shared bedroom for two children. 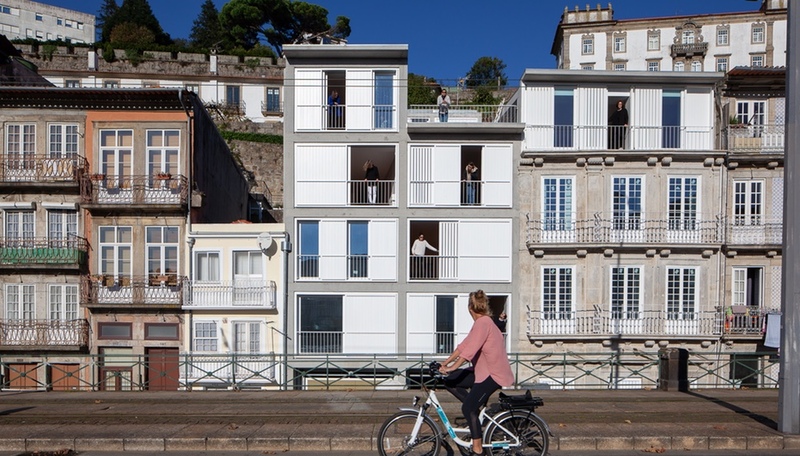 Circumscribed by free-standing walls, the space now generates an opaque section on the erstwhile fully glazed rear facade. Anyone lurking in the backyard’s lush flora and fauna at sunset will no longer behold the surreal view of a staircase that traverses the house from the top floor to the bottom across four levels. But so what? In its place there is now a functional, private bedroom area. To stop rain leakage at the entrance, the firm added chevron-shaped canopies above the front door. The ornamental gestures that many people associate with the Eppich – in particular an interior lattice wall in the dining area with a large oculus at its centre – required hard-headed decisions. The decorative element has long been a visual identifier whenever the house appears in the media or in books. The round window, and its evocation of 1970s Zen Buddhist culture, served no practical purpose other than marking the house within its era. With the feature’s removal, an expansive tableau vivant conveys a different semiotic. This is 2015, and as Vancouver’s North Shore bulldozes full-grown trees along with its mid-century heritage properties, a verdant landscape is becoming distinctive in its own right. 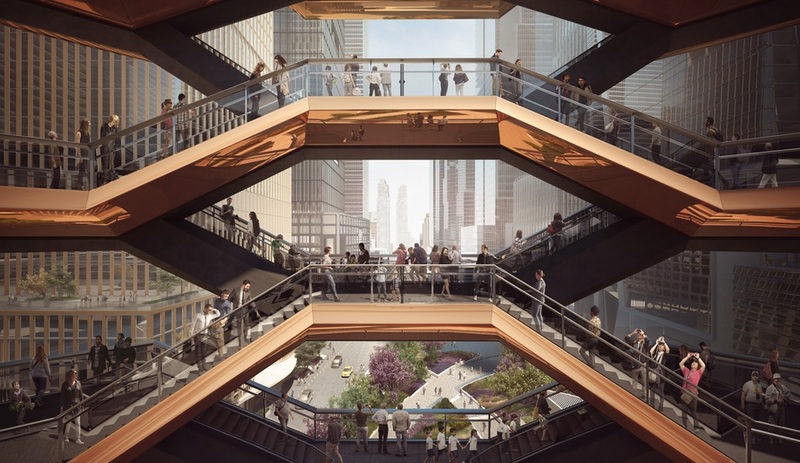 (The oculus wall was given to the city’s Arthur Erickson Foundation rather than being consigned to the landfill.) The most important signifiers, however, remain unchanged: the home’s artfully oblique positioning on its sloping site, and the spectacular pond and surrounding gardens. Thankfully, no safety barriers were added between the lower level’s concrete terrace and the pond. BattersbyHowat has reformatted Eppich House with a deft touch, extending its longevity and making it meaningful for a 21st­‑century family. Yet it essentially remains at the same size – 353 square metres – which is spacious enough, though small by comparison to the monster-home standards of the surrounding neighbourhood. 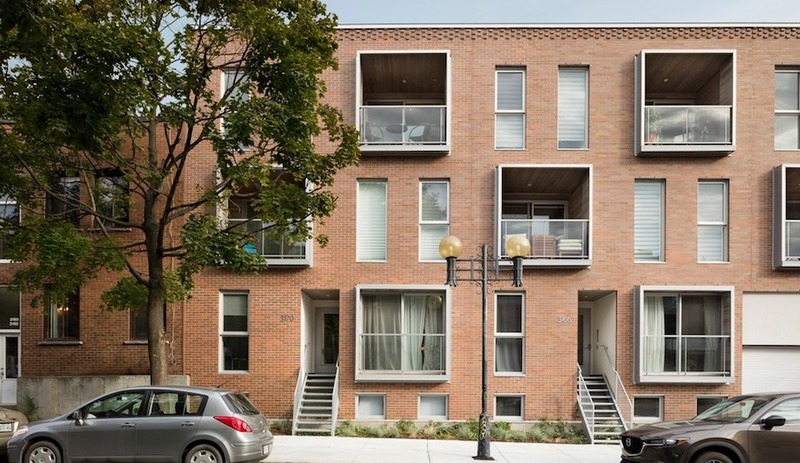 Battersby, coining an oxymoron for our age, sums up the entire renovation as “crazy-modest.” As modernist landmarks lose ground, this update saves a classic for at least another half century. That, says Battersby, is one way of thinking environmentally. Other features: Appliances by Gaggenau, Corian countertops and elm veneer cabinetry by Lauten Woodworking, ­living room furniture by B&B Italia, dining table and wooden stools by Riva 1920.